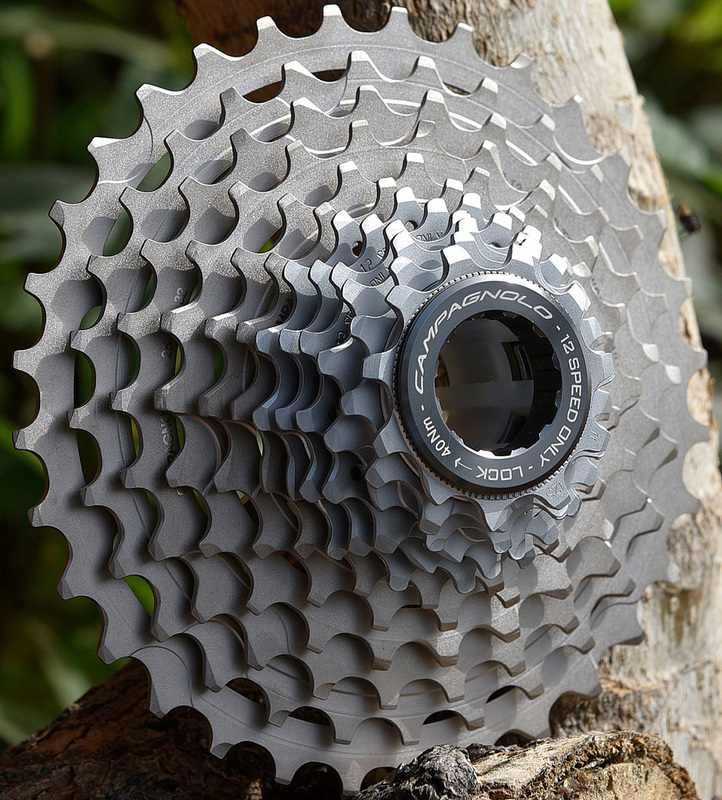 Campagnolo lead the market with 5, 6, 7, 8, 9, 10 and 11 speeds... Now the Campagnolo 12 speed launch leads the road cycling industry to the next gearing level by being the first 2 x 12 speed drive trains for their highest Record and Super Record level group sets. During a quick drop-in to their Vicenza Factory in January, there was definitely a buzz in the air. There was also a clue as I picked up a rear derailleur mold and noticed not only a different overall shape, but that the pulley cage was larger… At that point I thought we may be close to the Dozen. Suspicions were confirmed at their March Launch in Gran Canaria. 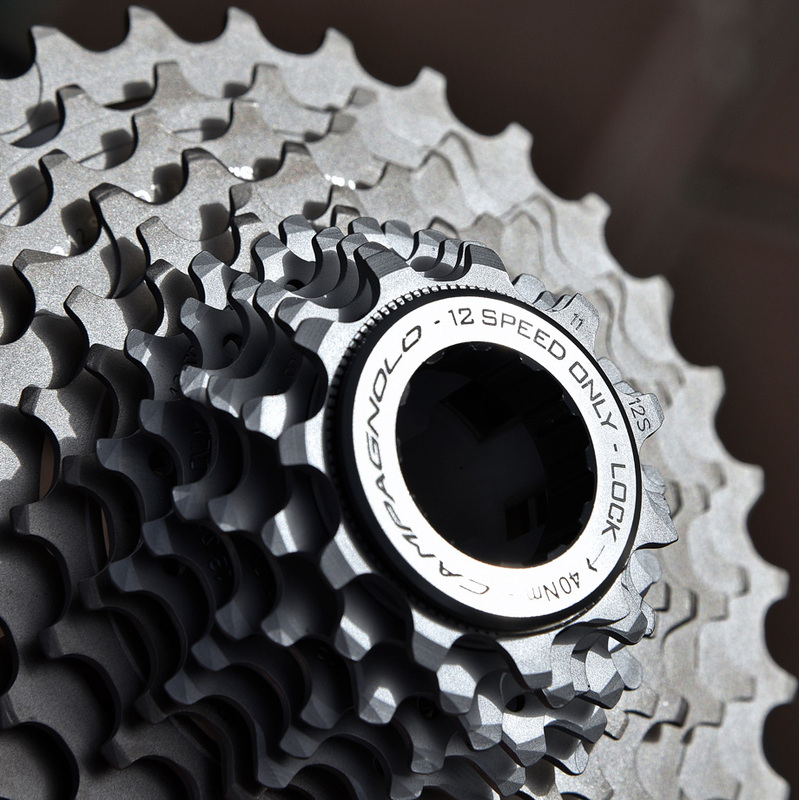 Campagnolo have launched 12 speed. 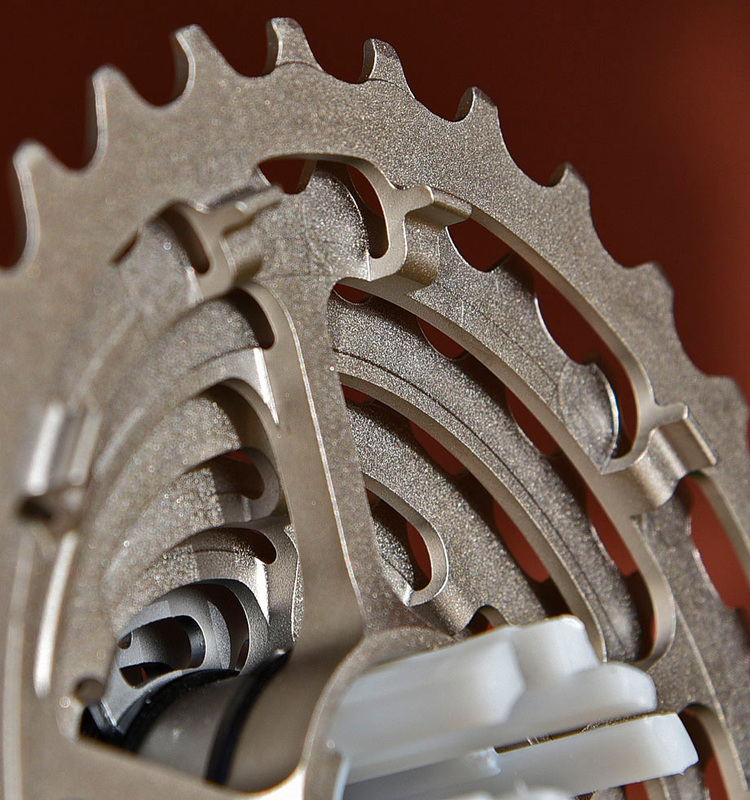 With this launch, Campagnolo close the gear gaps on wide range cassettes and increase performance with a full range of fully revised components for both Super Record and Record groups. The levers - Slightly revised shape for the hoods, more revisions at both the brake, up and down shift levers. The shape of the hood body is slightly revised with a little more curve and a better hood/rubber compound that is more grippy and a little softer, but not at all “mooshy”. 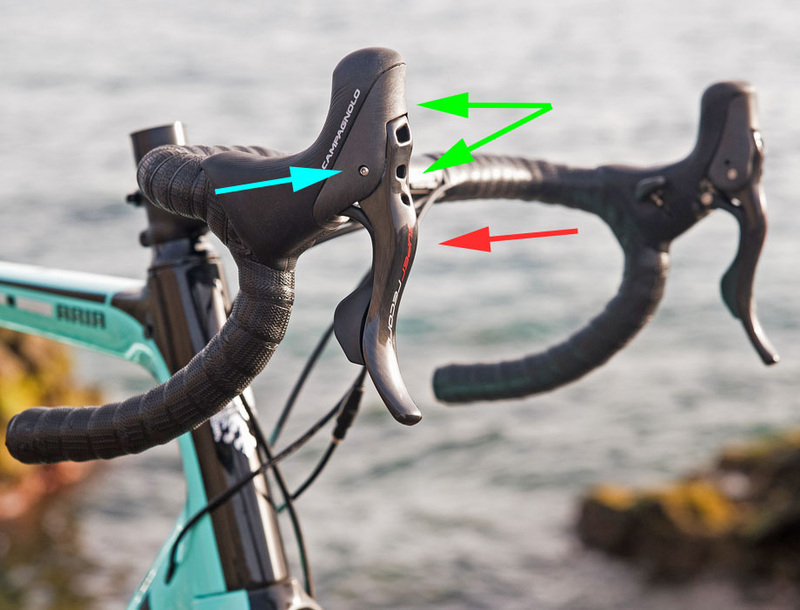 The most notable change to the levers ergonomics comes by way of a new brake lever shape that adds some slight depressions (Green) giving your top two fingers a very natural resting place with better grip. There is a more pronounced bulge at the center of the lever (Red) where your other two fingers typically apply braking force. This added shape makes for more comfort when riding and some added leverage when applying the brakes. 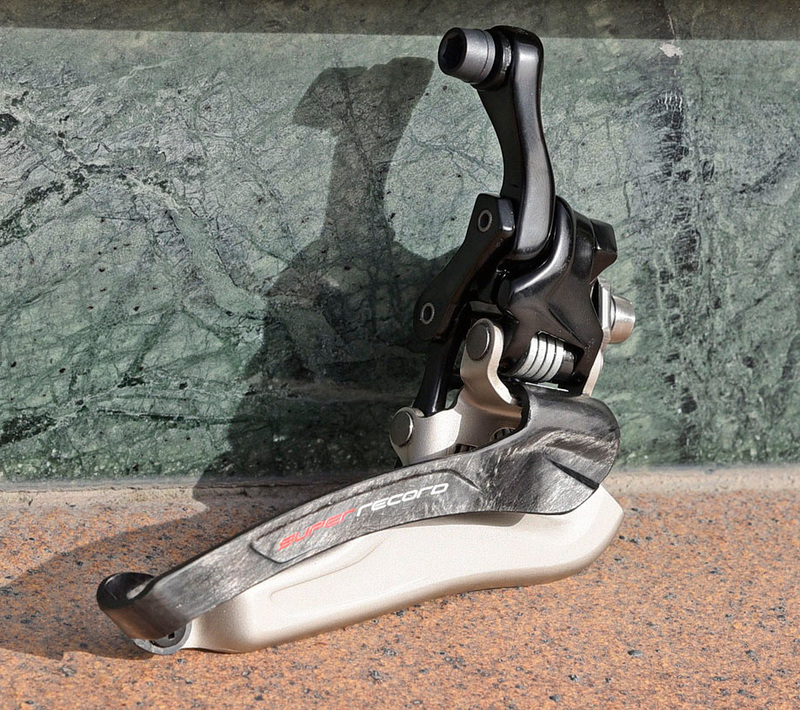 AND the braking leverage is greater with a new lower pivot position that allows not only for better modulation but a lever travel direction that is more straight backward toward your hands. Campy stays (thankfully) with One Lever / One Action and both shift levers are improved. The Thumb shift button now has more surface area. 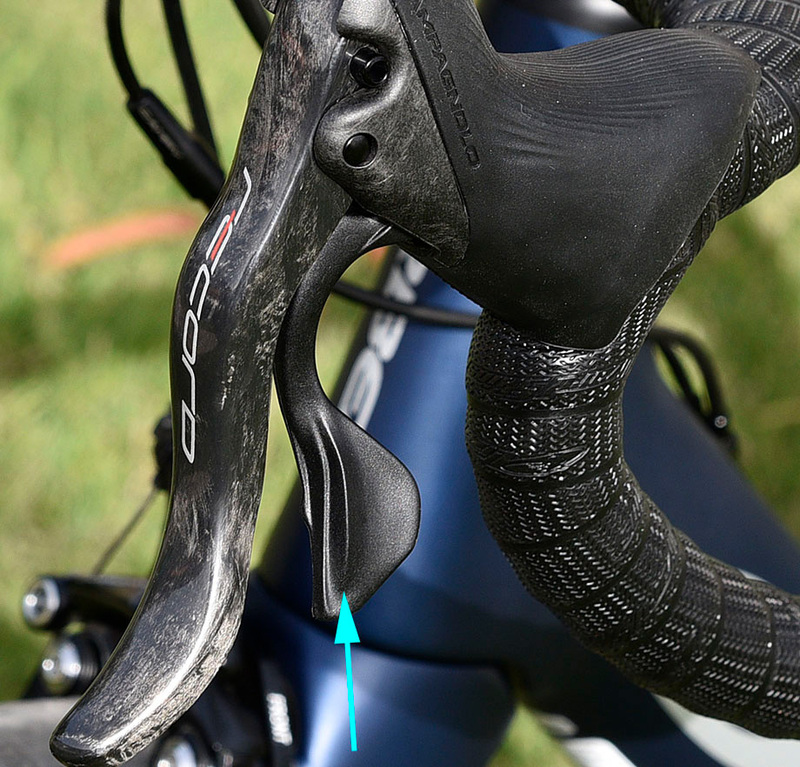 It’s now more friendly to shift in the drops as it gets a slight slope down toward your hands. I didn’t have any issues with the old thumb lever, but this is a definite upgrade in contact patch for shifting from the tops as well as the drops. 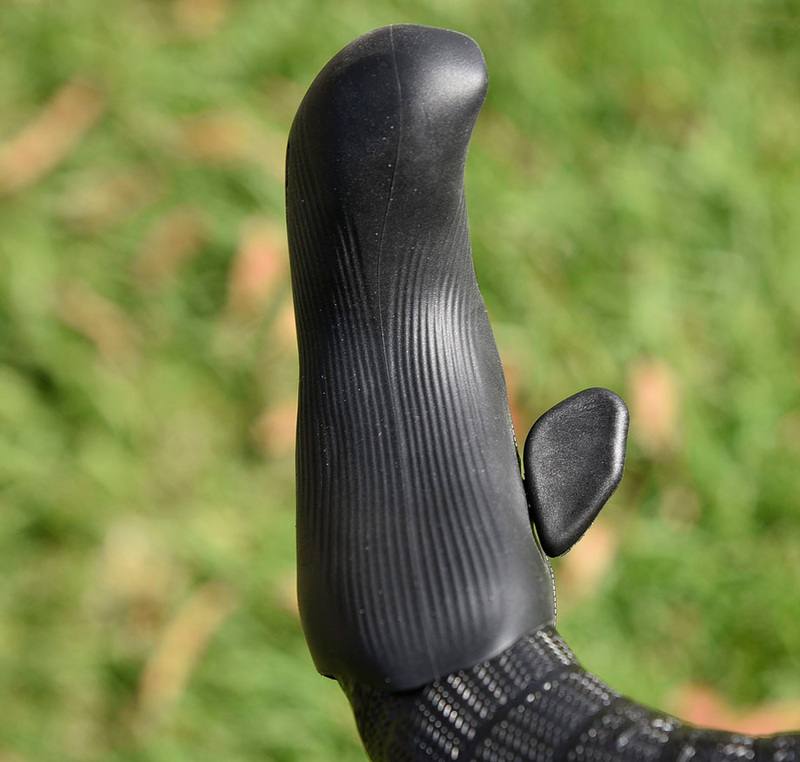 But the biggest lever upgrade is the larger finger shift paddle. The larger surface area is a big plus, but for me the more significant change was the angle of the paddle and the more pronounced / raised forward edge. My fingers no longer slip forward and instead settle into the depressed area of the paddle, giving a much more secure contact point. 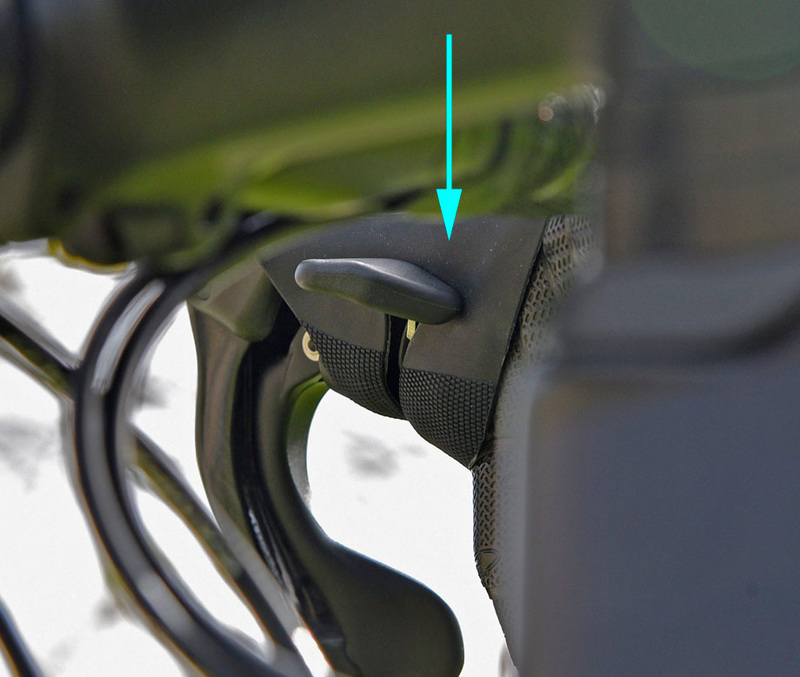 The net result of the lever updates is better performance in the form of more comfort in all hand positions and better / easier lever action and tunable braking. You don’t care which rod is which… But you do care that the front mech now stays nearly flat as it rises and lowers while moving out and in, where it used to swing in a bit of an arch. Couple this with a new design for the chain contact points and you have front shifting that is precise and nearly instant. That front shifting is also improved by refined chainring machining that creates more natural pick ups / ramps. Also note that each chain ring gets its own bolts. 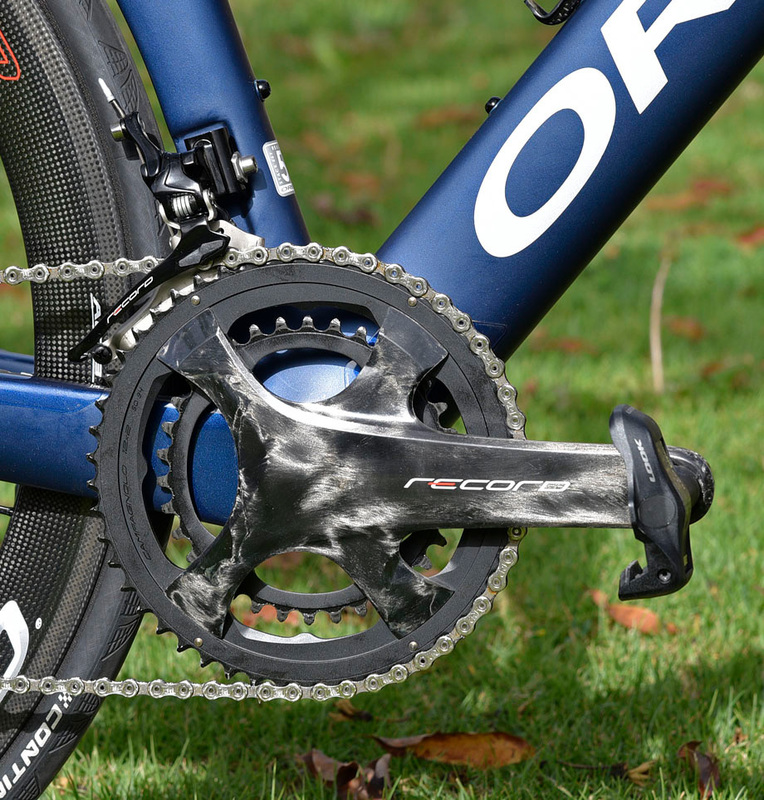 This allows for the cranks to carry a range of chainring sizes meaning you can run 50-34, 52-36 and 53-39 WITH THE SAME Record and Super Record cranks. You also have bolts fairly close to the teeth, making for a stiffer ring. The cranks will come in 4 lengths now (165-170-172.5-175) for both Record and Super Record. Both will also maintain the Q factor of past cranks at 145.5. Ask most component manufacturers what their biggest sticking point is when going to 10 and 11 speeds over the past few years and you likely would have heard “chain performance”. Historically, Campy have done chains VERY well. 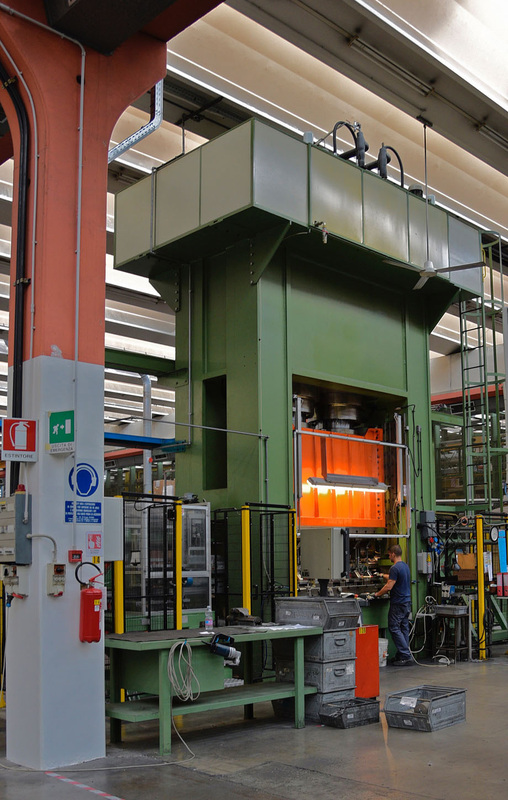 Recently, they were the best performing component manufacturer chain in independent testing. For 12 speed or for any chain really, there are several moving parts that have to be nearly perfect to work. In order to make 12 speed, the side plates are slightly changed but the pins and rollers are quite different. They have to be perfectly flush with the side links for 12 speed. Interestingly, making the chain with shorter pins and slightly skinnier rollers makes a lighter structure but the durability winds up equal to the class leading Record 11 Speed given the shorter pins and skinnier rollers. The Rear derailleur for both groups share the same key details (with some materials changes being the primary difference). Both have main body’s in Long Strand carbon fiber reinforced Polymer. One of the easiest things to spot are up-sized jockey wheels. These drop drag quite a bit as well as upping durability / longevity, carrying 12 teeth now. Less easy to spot are the parts tweaks that make for the precision and engagement improvements. 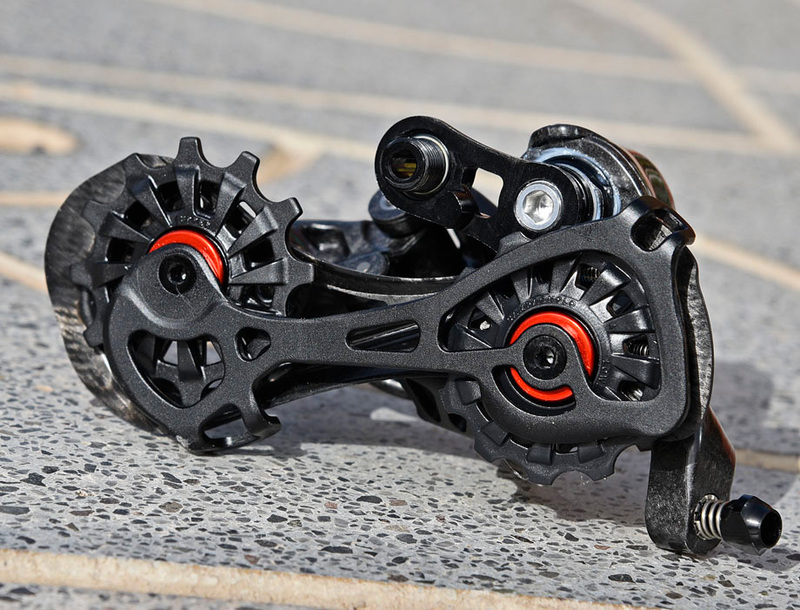 Similar to the front, the rear mech has a flatter trajectory that better aligns the pulleys with the cassette. 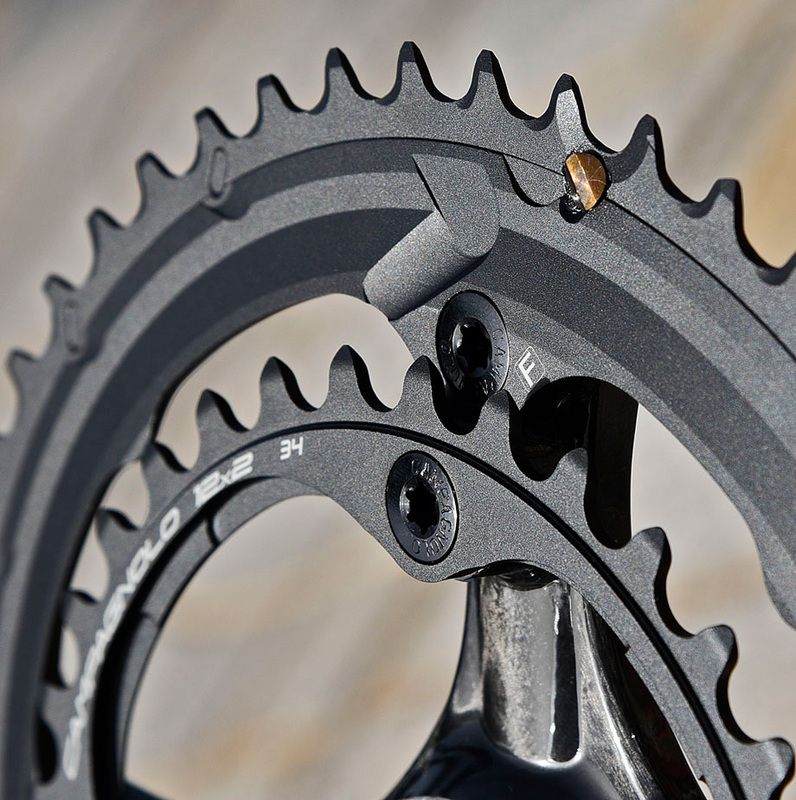 The jockey wheels also remain closer to the cassette through the entire range of motion AND the chain now wraps further round the cassette meaning more teeth are engaged in every gear. 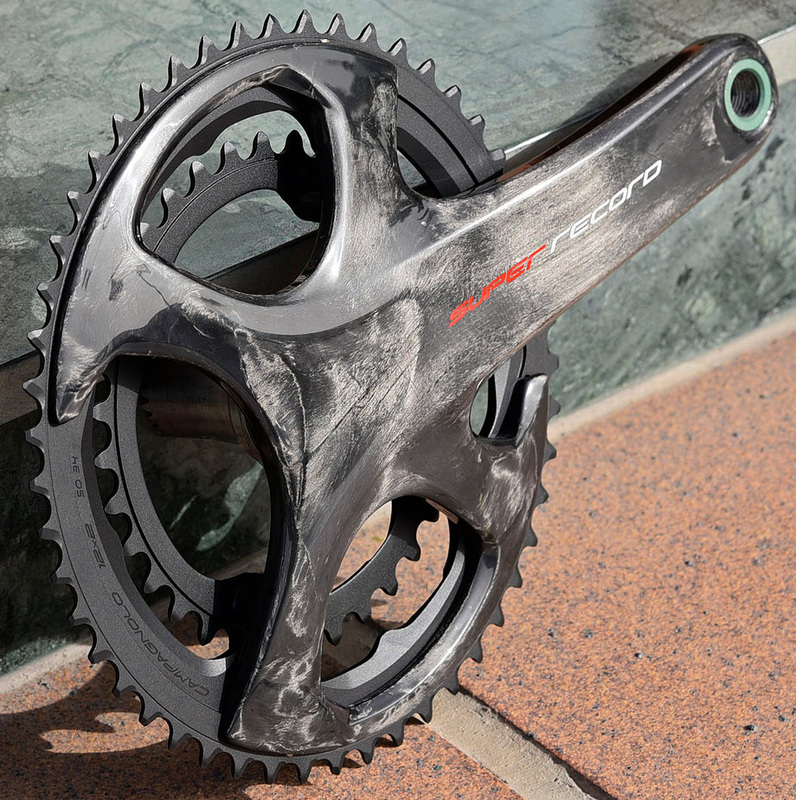 This will extend the life of both the chain and the cassette versus past designs. There’s also now an upper body return spring that absorbs vibration and helps avoid too much movement and eliminate some chain slap. One Rear Mech is all you’ll need for the wide Range Cassettes as well. The Mid sized cage will run both the 11-29 and 11-32 cassettes. With 12 cogs, you have single tooth increases for the first 7 gears. The machining is tiny art… And all of the cogs are separated by machined Aluminum spacers for precision. 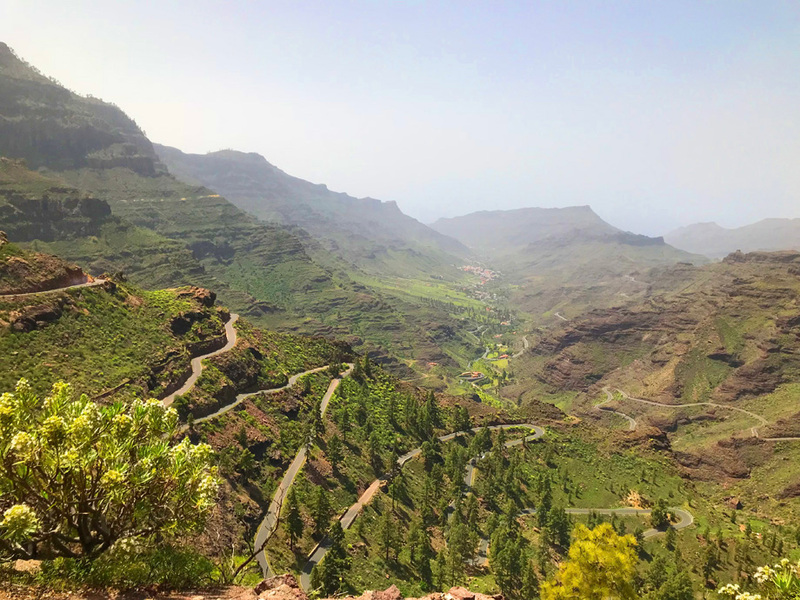 There are fairly few better places to test equipment in April than Gran Canaria… With that, several of cycling’s top journalists (and me) were able to spend several hours on variable terrain (nearly NONE of it flat) throwing multiple pressures at the parts on hand. The thing most notable about the new 12 speed groups for me was the front shifting. It’s instant and requires very little effort. Even trying to miss the ramps and pins and shift out of timing and under load resulted in a snap of the chainring up from small to large. Front shift happened so fast the first time that I was sure they had not adjusted the front properly and that NOTHING had happened, only to look down and see the front had done the job. Second notable is the smoothness and ease of shifting the rear. It’s now notably quicker and with less effort than past Campy groups. Still there though is the feel of the indexing between gears, letting you feel the gear changes at the rear, rather than the ultra-smooth but vague feeling you get with Shimano’s top Mechanical groups. Campy have a fully new set of cables and housing and that plays a part in the increased speed and ease of shifting as well, but my guess is that having a rear mech that is more precise and having effectively eliminated substantial space between gears plays the bigger role. 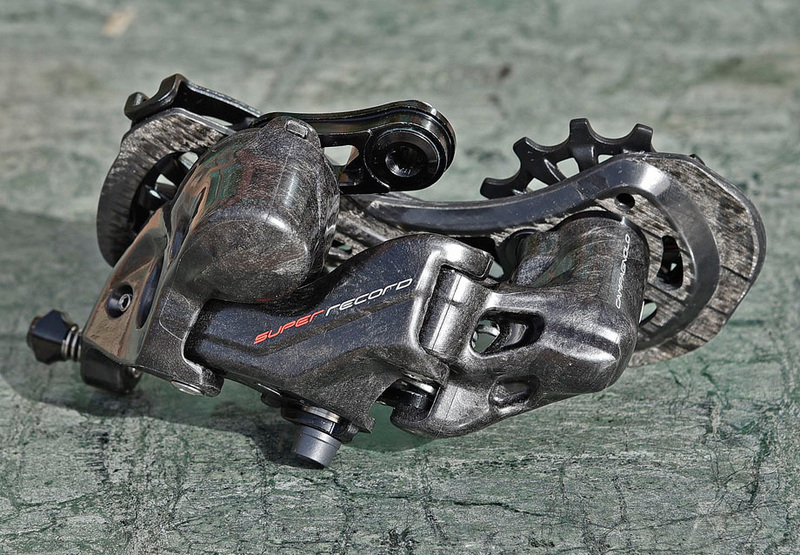 The net effect is faster and more precise shifting coupled with Campagnolo’s “One lever – One Action” making for zero chance that, under the pressure of friendly and not-so-friendly competition, you wind up making the wrong shift. Shutting down the gaps between gear ratios with wide range cassettes was a focus but Campy have nailed the execution of getting between these 12 speeds (x2) with the full rework of all parts. 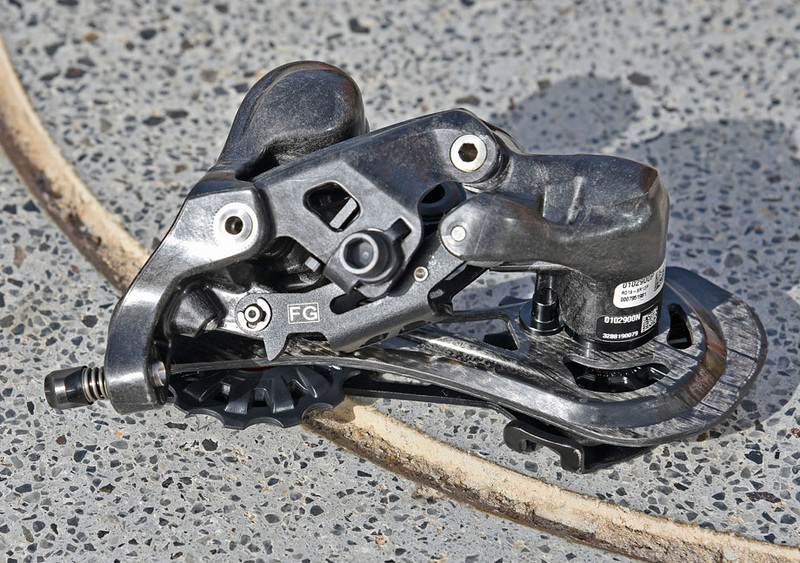 Of course, eliminating chain material (and dimension) might raise eyebrows but, again, the increased precision of operation for all components as well as the redesign of the rear derailleur is just as (or more) critical to long term function than the chain itself. 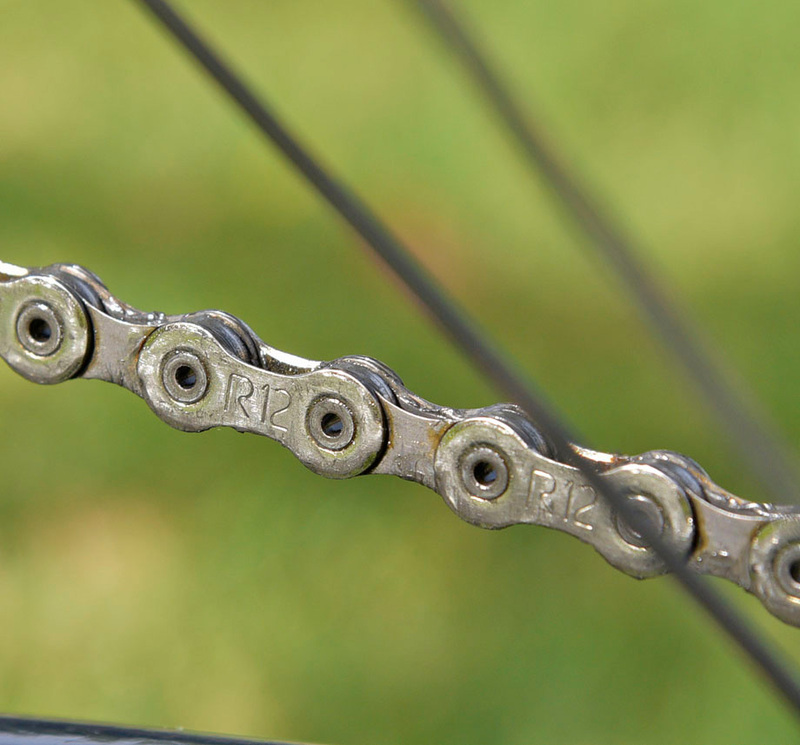 Keeping the chain closer to the cassette and making the chain wrap further around the cogs spreads the chain load over more teeth and decreases stress and wear. Yeah… And that front shifting. It is so quick and precise that you’ll find yourself changing gears and staring at it if you’re anywhere near the geek that I am. Just pay attention to the road while you do it… I nearly road off a cliff 6,000 miles from home (saved by disc brakes…). 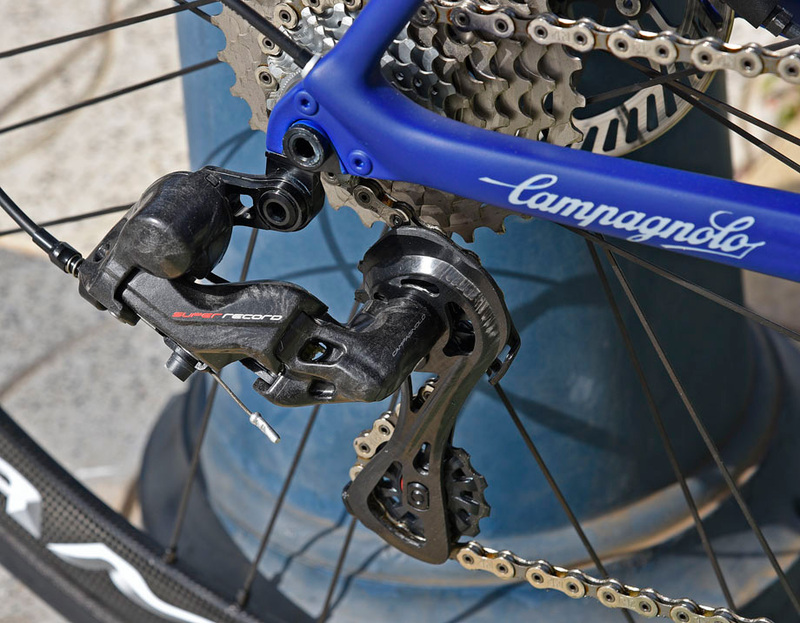 Campagnolo should have the new Groups in Disc and Rim Brake Mechanical out May/June. EPS versions tentatively scheduled for November '18. BIG THANKS to Thomson Bike Tours for getting several groups through hours of riding on very demanding terrain with fantastic support and professionalism. Thomson will do it all, from press launches to following big races to delivering custom group tours. Thanks as well to Pablo Moreno Corbera (Barcelona) for some fantastic Photography!